Funds of hedge funds started 2013 on a positive note amid renewed risk appetite in global markets. The Eurekahedge Fund of Funds Index was up 2.19% in the first two months of the year as underlying single managers witnessed strong returns on the back of rallying global markets. On the flipside, the trend of net negative flows continued from previous years as multi-managers saw net outflows of more than US$25 billion. 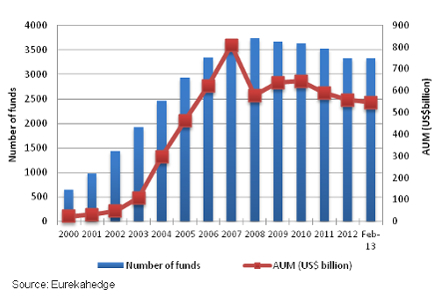 The funds of hedge funds sector grew at an incremental pace in the 2002 to mid-2008 period, increasing the size of the industry from less than US$100 billion to a maximum of US$826.2 billion in March 2008. This growth in assets was accompanied by a simultaneous increase in the fund population, with the total number of funds of hedge funds increasing from below 1500 to over 3700. With the onset of the global financial crisis in 2008, the industry was hit with excessive losses and widespread redemptions and since then the multi-managers have struggled to attract a significant amount of assets. Assets under management (AUM) declined to US$560 billion by April 2009, with most of this decline coming through net negative asset flows as investors put up redemption requests en masse. The funds of hedge funds sector rebounded for two brief periods since 2008. In the second half of 2009 with the rebound in global markets the assets in funds of hedge funds also climbed back above the US$600 billion mark, mostly through performance-based gains although the sector also attracted some capital during this period. In the last four months of 2010, a second period of growth was witnessed with most of the gains coming through healthy performance. The industry has since been in a slow but constant decline.